Our push pier systems are made of steel and are driven deep into the soil beneath a foundation to solve settlement problems. Push piers can be installed inside or outside your foundation walls and are not visible once the repair is complete. In many scenarios, push piers not only stop settlement but also lift the foundation back to its original position, closing cracks and improving window and door operation. Our push pier system is the permanent solution you need. Call us for a free push pier installation quote today! We serve Grande Prairie, St. Albert, Sherwood Park, and many nearby areas in Alberta. As with any family of products, there are good, better and best options. When you're talking about investing in your home's structural stability, it's a good idea to go with the best. Are you looking for local foundation contractors in Alberta? 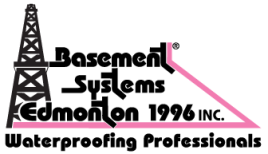 At Basement Systems Edmonton, our team of in-house foundation experts has warrantied solutions for structural issues related to settling foundations of all types. Our foundation push pier systems include a 25-year warranty against manufacturing defects, as well as our own performance warranty. We're proud to serve Grande Prairie, St. Albert, Sherwood Park, and many other parts of Alberta.